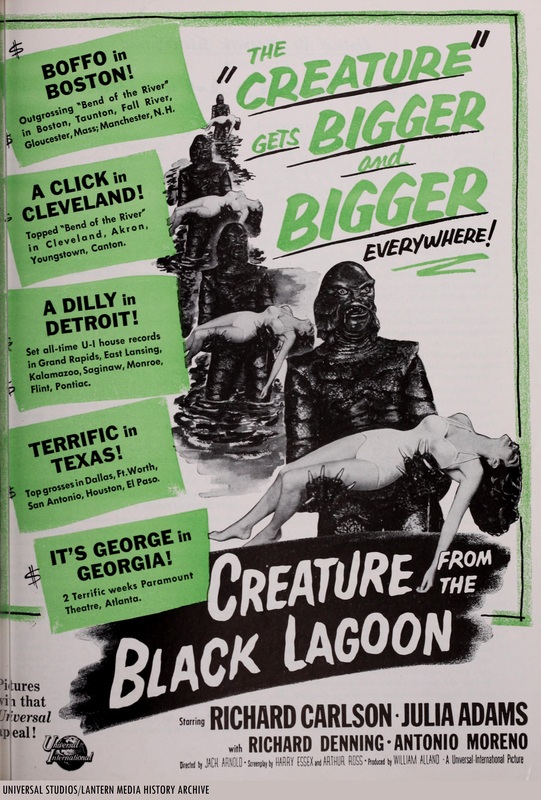 Fellow Svengoolie SvenPals from coast-to-coat will be excited for his upcoming big broadcast of a classic Universal Studios underwater monster feature. The legendary Berwyn/Chicago-based monster/horror film host will present his big broadcast of “Creature from the Black Lagoon” (1954), this Sat., Dec. 8 at 8 p.m. Eastern/ 7 p.m. Central on Me-TV. The 1954 Universal Studios creature/monster feature was directed by veteran director Jack Arnold; who also worked on Universal’s “It Came from Outer Space” (1953; the studio’s first 3-D feature), “Tarantula” (1955), “The Incredible Shrinking Man” (1957) and “Monster on the Campus” (1958). Arnold also directed the second feature in the studio’s “Creature” series, “Revenge of the Creature” (1955, also filmed in 3-D). The final film in Universal’s “Creature” trilogy, “The Creature Walks Among Us” (1956) was directed by John Sherwood. This will mark Svengoolie’s sixth big coast-to-coast broadcast of “Creature from the Black Lagoon” (1954) on Me-TV. He previously showcased Arnold’s Universal monster-creature classic back in April 2011*, May 2012* (according to fellow super SvenPal David Fuentes and his official “Terror From Beyond the Dave” YouTube channel and Edward Reed’s “Svengoolie Fan Club” forum), July 2014, Nov. 2015 and July 2017. The players who appeared in Jack Arnold’s 1954 Universal monster-creature feature were Julie Adams (as Kay, Adams received screen credit under the name of “Julia Adams” in the film; Adams previously appeared in Universal’s ““Francis Joins The WACS” with Donald O’ Connor and Chill Wills), Richard Carlson (as David Reed; Carlson previously appeared in Arnold’s “It Came From Outer Space” in 1953), Ricou Browning (who appeared in an uncredited role in the “Creature” costume for underwater sequences), Ben Chapman (who appeared in an uncredited role in the “Gill-Man” costume for land sequences), Richard Denning (as Mark Williams), Nestor Paiva (as Lucas), Whit Bissell (as Dr. Thompson; Bissell later appeared in Irwin Allen’s 1966-67 TV adventure/sci-fi series, “The Time Tunnel”), Antonio Moreno (as Carl Maia), Bernie Gozier (as Zee) and Henry A. Escalante (as Chico, Escalante was credited under the name of “Henry Escalante” in Arnold’s Universal production). Fellow fans of Svengoolie and Universal Studios monster films will be jumping for joy this weekend when he will showcase a 1954 cinematic gem. The iconic Berwyn/Chicago-based horror film host will be presenting the 1954 Universal monster film classic, “Creature From the Black Lagoon.” The fun starts this Sat., July 15 at 10 p.m. Eastern/9 p.m. Central on Me-TV. This isn’t the first time that Sven has shown “Creature From the Black Lagoon.” He had previously shown the film in July 2014 and Nov. 2015 on Me-TV. The film was directed by Jack Arnold, who also directed “It Came from Outer Space” (1953), “Tarantula” (1955) and “The Incredible Shrinking Man” (1957). He also directed the 1955 “Gill-Man” sequel for Universal, “Revenge of the Creature” (all aforementioned films were previously shown on Sven’s showcase). James C. Havens directed the underwater sequences for Arnold’s film. The players who appeared in “Creature From the Black Lagoon” were Richard Carlson (as David Reed), Julie Adams (as Kay, Adams was credited as “Julia Adams” in the film), Richard Denning (as Mark Williams), Antonio Moreno (as Carl Maia), Nestor Paiva (as Lucas), Whit Bissell (as Dr. Thompson), Henry A. Escalante (as Chico, Escalante was credited as “Henry Escalante” in the film), Bernie Gozier (as Zee), Ricou Browning (who appeared in the “Gill-Man” monster costume for underwater scenes) and Ben Chapman (who appeared in the “Gill-Man” costume for land scenes).